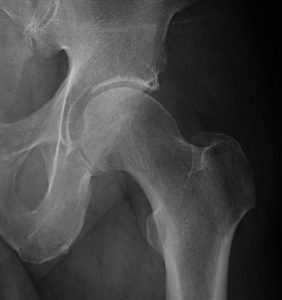 Femoroacetabular impingement, or FAI, is a cause of hip and groin pain in athletic individuals. Usually it is not an injury that occurs after an acute event, but instead it often manifests as hip pain that develops over time. The problem results from abnormal contact between the femoral head or neck (ball) and the acetabulum (socket). Bony prominence on either the femoral head and neck or the acetabulum can be the source of problems. The athlete often complains of groin pain with certain maneuvers, like squatting, deep hip flexion, cutting and pivoting and changing directions. Arthroscopic or open surgery can remove the abnormal contact between the femoral neck and head and the acetabulum. An athlete or active person with femoroacetabular impingement often complains of pain deep in the groin. Certain maneuvers and positions, such as squatting, deep hip flexion and rotation of the hip cause groin pain. Occasionally the athlete will complain of pain in the groin with cutting and pivoting maneuvers and changing directions in sports. A sports medicine physician will perform a physical examination to try to determine the location of the patient’s hip and groin pain. Often the patient will not feel pain or tenderness with direct touch of any particular area or body part. Often range of motion of the hip, especially full flexion with internal or external rotation of the hip, reproduces the patient’s pain. X-rays often show the problem, especially when there is a deformity of the femoral neck or abnormal positioning of the acetabulum. An MRI is often performed to look for other sources of pain including a hip labral tear or cartilage injury within the joint. While nonsurgical treatment, such as physical therapy and anti-inflammatory medications, is often unsuccessful, it can still be useful to try to decrease pain and increase strength and range of motion. If the athlete is unable to perform the sports or exercises that he or she wants to play, surgery can a reasonable option. The surgeon will remove the abnormal contact between the femoral neck and head and acetabulum through an open or arthroscopic surgery. Which procedures are done depend on the location of the problem and how extensive the bony impingement is. Also repair of the torn labrum and treatment of cartilage injuries can be performed at the same time. Usually the athlete is made nonweightbearing for up to six weeks before instituting progressive weightbearing, range of motion, and strength in. Return to sports can take many months, but athletes with this problem often return to competitive levels.